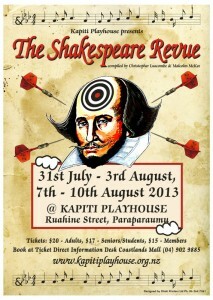 Our next production - The Shakespeare Revue - Kapiti Playhouse Inc.
10th July 2013 : Public bookings are now open! This collection of humorous skits, sketches and songs takes a lovable but irreverent poke at the life and works of William Shakespeare. You have all heard of him, but not necessarily in this way! First presented by the Royal Shakespeare Company, this Revue contains some of the finest comic material inspired by the Bard. There are over 40 contributors to this entertainment, including Noel Coward, Monty Python, Stephen Fry, Hugh Laurie, Tim Brook-Taylor, Victoria Wood, Maureen Lipman, Alan Bennett, Peter Cook, Dudley Moore. It features songs and comedy sketches from Edwardian Music Hall through Cole Porter to Stephen Sondheim. With contributions from the cream of writing and musical talent this collective masterpiece is certain to ENTERTAIN! The Shakespeare Revue is an evening of sparkling wit and unabashed fun. This show is especially suitable for a group entertaining evening out. The co-directors are Dom Ware and John Govier; both bringing a wealth of theatrical experience to this production. The musical director is Maria Vink who is well known to people who attend Coasters’ productions! The cast consists of Teresa Sullivan, Tony Tait, Malcolm Parker, Rebecca Fraser, Cavan Haines, Penelope Haines and Olivia Daniel – some recognisable as Coasters! Seating is cabaret style, BYO or purchase at the theatre. Performance dates are the 31st July, 1st to 3rd August, and 7th to 10th August 2013 at 8 pm at the theatre, 7 Ruahine Street, Paraparaumu. Ticket prices are Adults $20, Seniors/Students $17, and Members $15. Public bookings will be available from Ticket Direct Information Desk Coastlands Mall (04) 902 9885.